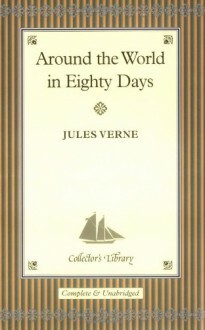 Phileas Fogg is a man of habit, a Victorian gentleman who follows the same routine every day--until he accepts a wager that he can circle the globe within eighty days. Thus begins a hair-raising journey, in which Fogg's obsession with his timetable is complemented by the dynamism and versatility of his French manservant, Passepartout, whose has a talent for getting into scrapes as the two dash across continents in a suspenseful race against time. The world's greatest works of literature are now avaialble in these beautiful keepsake volumes. Bound in real cloth, and featuring gilt edges and ribbon markers, these beautifully produced books are a wonderful way to build a handsome library of classic literature. These are the essential novels that belong in every home. They'll transport readers to imaginary worlds and provide excitement, entertainment, and enlightenment for years to come. All of these novels feature attractive illustrations and have an unequalled period feel that will grace the library, the bedside table or bureau. That was awesome! I love when these classics turn out to be addictive page-turners. Even though I knew Fogg had to triumph, I admit I had several moments of true anxiety, so double points. Into the podium of Verne's favorites it goes. Now, what do I do with this furious raging of my wanderlust?